LSU punter Brad Wing ran a fake punt into the end zone for a touchdown, only it was called back because of his "excessive celebration". His 52-yard run was erased by an unsportsmanlike conduct call after he held the ball out toward a Florida defender. You have to see this one to believe it. Two things: That's one stupid rule and that's one awesome camera angle. I was glad the Canucks lost. 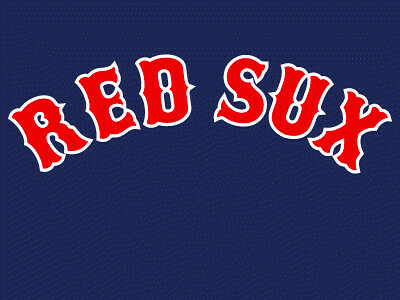 Normally, I hate Boston, but in this series, they had my full support. 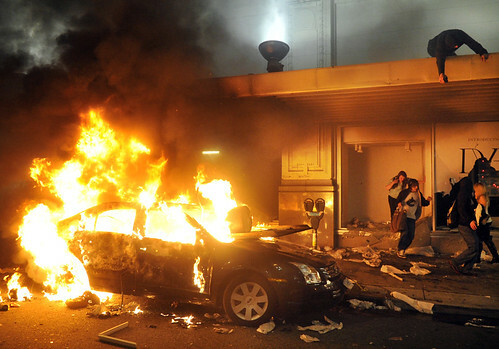 It sounds like more folks are talking about the riots than the series. That's too bad. 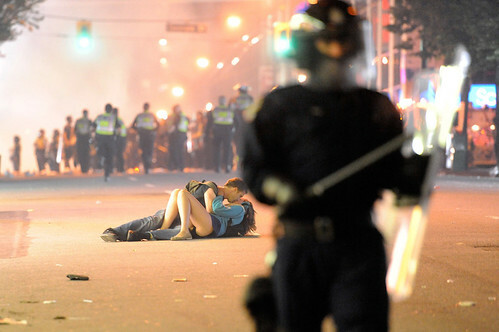 If you want to see some amazing photos of the Vancouver riots, you want to visit the National Post. 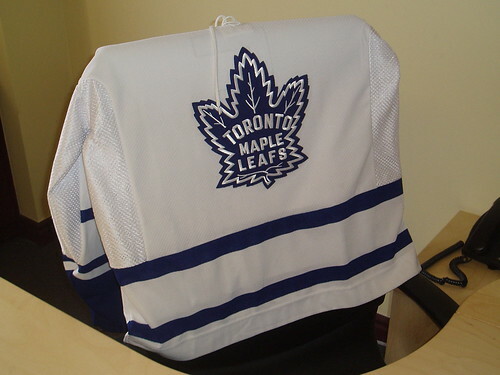 And with hockey officially behind us this season, our Leafs watch officially begins. Go Leafs Go! I've been calling for a Winnipeg Jets mulligan. The Jets were an easy team to like, and I wanted the team back in Winnipeg. I closed that entry with a simple plea: Bring back the Jets. A deal has been reached to bring the Atlanta Thrashers to Winnipeg. They'll play next season. As of this moment, they haven't announced their name. This team has to be called the Jets. The NHL owns the rights to the name, and they have no issue with it returning to Winnipeg. In my opinion, there is no alternative. 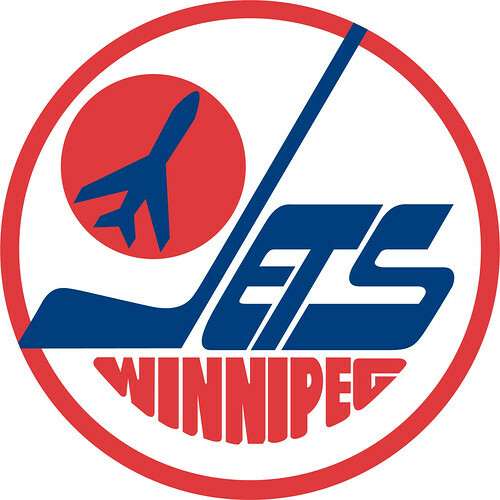 An NHL team in Winnipeg is the Jets. End of story. What do you think Winnipeg's NHL team should be named? Mike Wilner on Aaron Lobel: Where's Aaron Today? 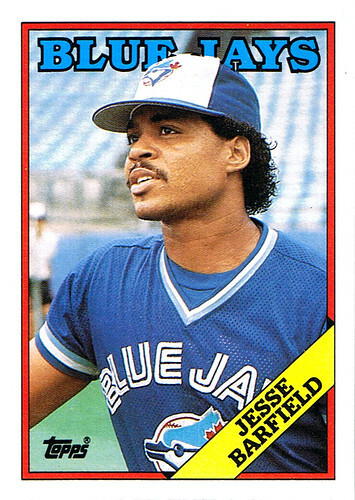 I used to watch a little call-in sports show on Cable 10 called Let's Talk Sports. I wrote about Let's Talk Sports over six years ago if you want to read a little more about my memories of this cheesy local sports show from yesteryear. The hosts were Mike Wilner and Aaron Lobel. We all know what happened to Mike Wilner: he's host of Jays Talk on The Fan 590 and one of the top Jays reporters in the city. But what of Aaron Lobel? Thanks to a twitter exchange with Mike Wilner yesterday, we know what happened to Aaron Lobel, and it might surprise you. Aaron Lobel founded America Abroad Media (AAM) and serves as the organization's president and chairman of the board, as well as executive producer of America Abroad and AAM Television. Mr. Lobel received a Ph.D. in International Affairs from Harvard University's Department of Government, where he was also awarded the University's top teaching award, the Joseph Levenson Prize. Prior to founding America Abroad Media, Mr. Lobel was a Research Fellow at the Brookings Institution in Washington D.C.; National Security Fellow at the John M. Olin Institute for Strategic Studies at Harvard University; and a National Security Fellow at the Belfer Center for Science and International Affairs at Harvard's Kennedy School of Government, where he edited Presidential Judgment: Foreign Policy Decision Making in the White House (Hollis Press 2001). Mr. Lobel currently serves on the Advisory Board of Business for Diplomatic Action, Securing America's Future Energy (SAFE), a member of the Council on Foreign Relations, and is a consultant to the Bipartisan Policy Center. Mr. Lobel is a native of Toronto, Canada. He lives in Washington, D.C with his wife and son. I'd still prefer to fill Mike's shoes than Aaron's. This is the greatest sports montage I've ever seen. I've watched it three times now, and each time I got chills. As a commenter pointed out, to call this video epic is to under serve the visuals. It's uber-epic, and the best montage I've seen since All Heart. I warned you about the chills, didn't I?